Additional Info: We make all beds before arrival and provide towels in both bathrooms. £50 Deposit to be paid on every confirmed booking, with balance to be paid 6 weeks before. A £50 security deposit to be paid 6 weeks before which will be fully refunded if there is no major damage or loss of any of the items or contents. 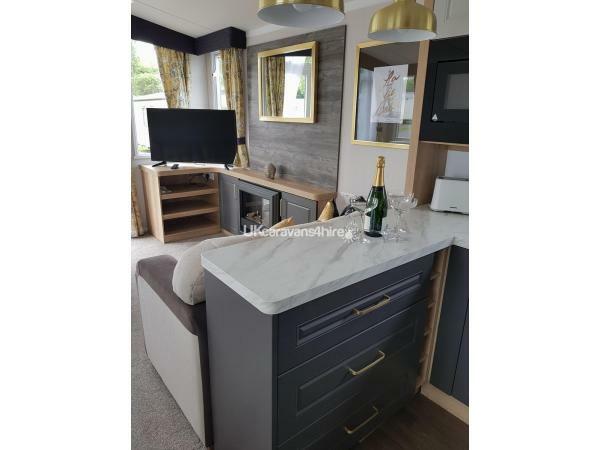 A beautifully decorated 38ft x 12ft brand new caravan with fully fitted kitchen with integrated dishwasher, full size fridge freezer, oven, hob and microwave complete with all crockery, cutlery, pans and glasses. 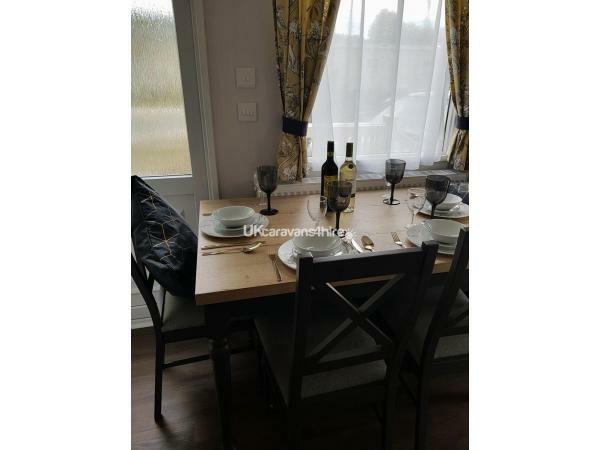 Large 3 seater and 2 seater sofas, free standing dining table and 6 chairs, coffee table and stools, double outward opening French doors. 40" TV with DVD player. 3 bedrooms. Master bedroom is en suite and has fitted wardrobes and dressing table. Twin bedroom 1 has fitted wardrobe and wall mounted freeview TV. Twin bedroom 2 has fitted wardrobe. Large 12ft x 8ft cream decking area to side with furniture and lighting. 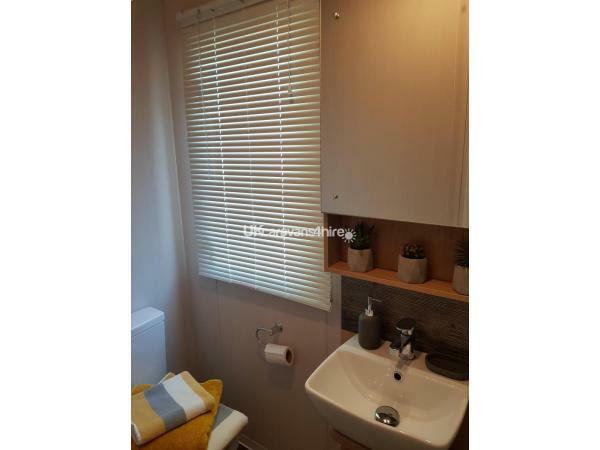 Fully double glazed and centrally heated throughout. All beds will be fully made and towels will be provided in each bathroom. There are cleaning products and toilet rolls provided. 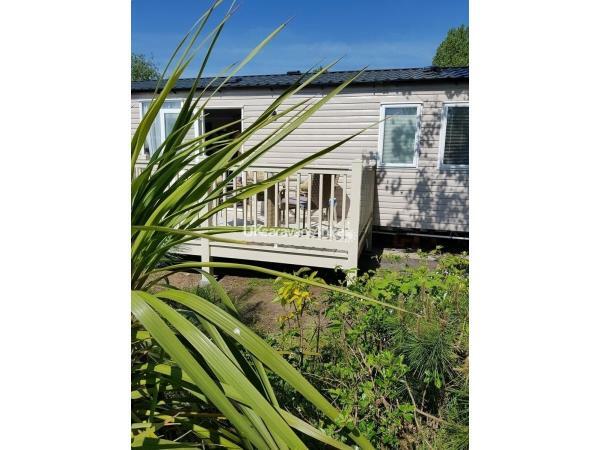 The caravan is situated on a corner plot and is given some privacy by trees and bushes. It is 2 minutes walk to the Boat house and restaurant as well as the amusement arcade and show bar. There is also an indoor heated pool with water slide and a new 2018 lazy river which opens in May. We do not provide passes for the bar or pool but these can be purchased at the customer services desk. 10 minute drive to Blackpool Centre, with the nature reserve of Marton Mere being a 3 minute walk away. Stanley Park and Blackpool Zoo are a 5 minute drive away. Full activity programme is available for children of all ages. 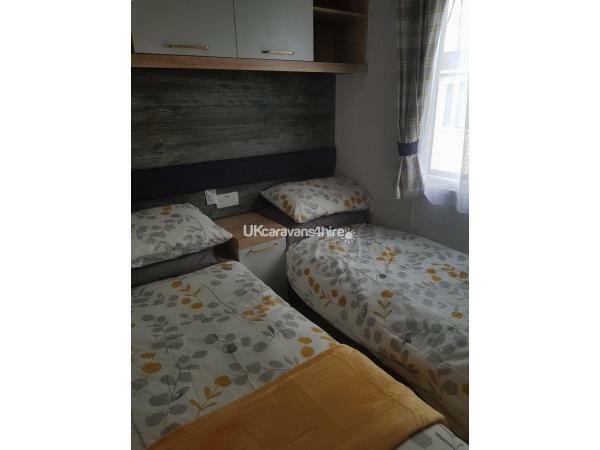 This is a private owned caravan and is cleaned and made ready for each guests arrivals by the owner. Please read reviews for the feedback we received on our first years rentals. We have just stayed at this caravan for 4 nights with my 2 children and my parents. There was ample room for the 6 of us and the beds were made up lovely for us all, and were very comfortable. The caravan had everything we needed and it was in a great position with only bring 2 minutes walk from the main areas on the park. It was also lovely and clean and very modern. The owners have been lovely and friendly from the start and very helpful. We would highly recommend staying here and we will definitely be visiting again ???? Hi Rachel I'm really glad you enjoyed your stay. Look forward to your return. The caravan was spotless, Gill was able to answer any questions that I had promptly. If you are looking to book I would not hesitate, you will not be disappointed. Fantastic stay, deserves the review ratings. If I am going to book a caravan at Marton Mere in the future, it will be this one. Thank you so much Gill. Your caravan is outstanding. Thank you very much and we look forward to you being our guests again. Only my second time booking privately and wish I had done it sooner!. 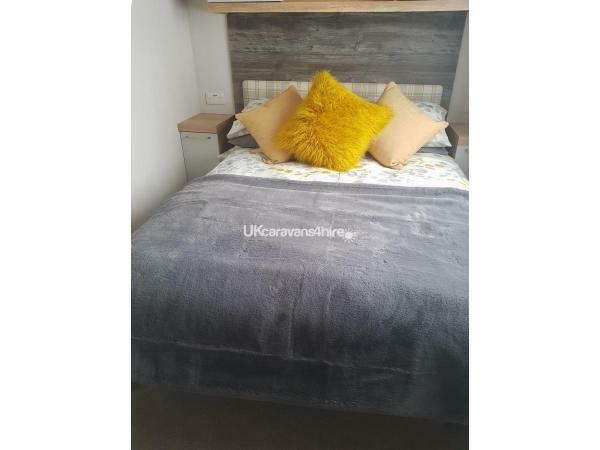 This caravan is the best one I have stayed in as soon as you open the door it is beautiful and spotless!. Even by the end of the week you could still smell the freshness from the bedding!. Gillian was great at communicating from when I had booked to when we left and even went out of her way to get us a bed guard for our toddler. The caravan is well equipped with a full fridge freezer and dishwasher which was a bonus feel your on holiday not doing dishes!. The bed in the master bedroom was so comfy and had an en-suite also a tv. One of the other bedrooms also had a tv which my son loved. Also the caravan had free wifi and a box to watch Netflix etc which is an added bonus!. Just want to thank Gillian again and will definitely book again next time we are at Blackpool!. Thank you very much Shona. Look forward to your return. You are very welcome. Look forward to you visiting us again. Absolutely beautiful caravan, spotless on arrival and the added extras of jam, tea, coffee, condiments etc were brilliant. Amazing location a three min walk from the pool, entertainment and restaurant. Gill was so helpful in all correspondence and we will definitely be back to this caravan again! Thanks very much Michelle. We look forward to welcoming you back! Caravan was beautiful, brand new and very clean. Going that extra mile with the tea/coffee jams,towels and bedding makes you and your caravan stand out from the rest. Highly recommended. Thank you very much. We want our caravan to be as welcoming as possible. Hope to see you again. 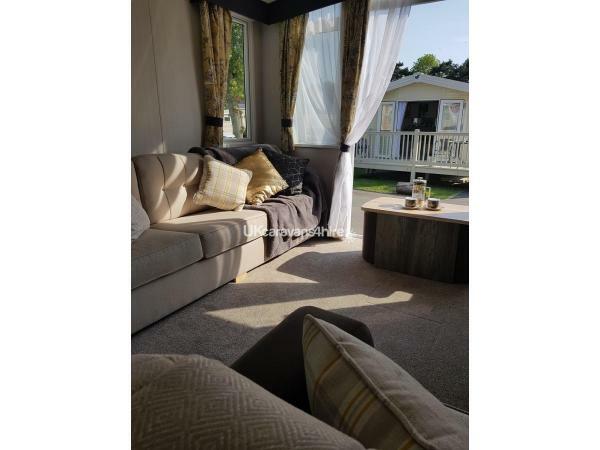 Wow, just back from a long weekend and this caravan was nothing but perfect, Gillian has this caravan superbly decorated throughout, all beds were made up, towels provided (all smelling wonderful) the attention to detail was exceptional. All the little touches, from the jars of jam to all the condiments you would need on a holiday that you would usually forget made it even more special, having spent some holidays in statics i can honestly say this was the best by far. defiantly setting the bar high for any other hire. Gillian was so easy to deal with and a pleasure to talk to, even get the caravan ready for us before the estimated time and texting to let us know. Thank you again, we will certainly be back and would recommend to anyone. 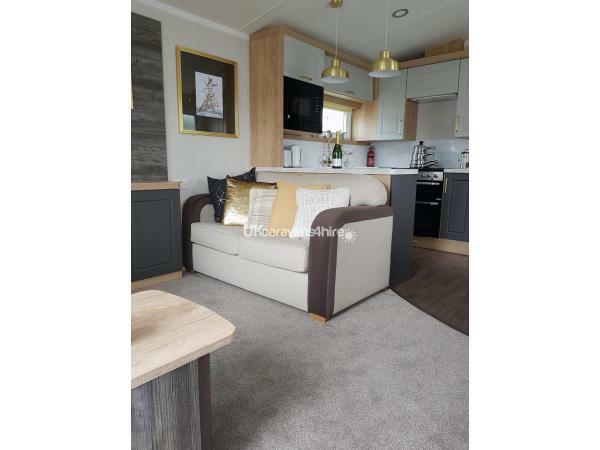 Fabulous caravan, so homely, comfortable and it certainly has the wow factor. The caravan was in perfect condition and Gillian had even made up the beds for our stay. The complementary tea, coffee and various condiments were really appreciated and the dishwasher is certainly a bonus. Gillian certainly makes sure you are very comfortable. Thank you so much Gillian. Bless you Denise. Thank you very much and hope to see you again soon. The accomodation was superb. We have stayed in some high spec caravans but this is by far one of the best. Gillian is a wonderful owner who most certainly isn't in this solely for the money aspect. She goes the extra mile and the little touches of kindness e.g. condiments, preservatives and spreads (love it or hate it, there was even mini marmite pots which my other half was over the moon at to the point I had to buy another loaf of bread). Communication was important to us as we had never gone private before but we had no need to be cautious as Gillian put our minds at rest and kept in touch right up to our arrival day. We would highly recommend this accommodation and look forward to our return. Just come back from a relaxing week at Marton Mere.This could of been a full on the go holiday with Blackpool attractions just down the road,and the park attractions,but with the teenage children they were so comfy in the caravan they never wanted to go out.This is a lovely caravan with all home comforts and more.We were happy to cook here 2 nights as a dishwasher looks after the mess after.Really comfy beds (kids didnt want to get out of)which give us a chance to take breakfast up at the boathouse restaurant.or eat outside on the veranda. A lovely touch was the welcome pack with various teas,coffee,spreads,etc. 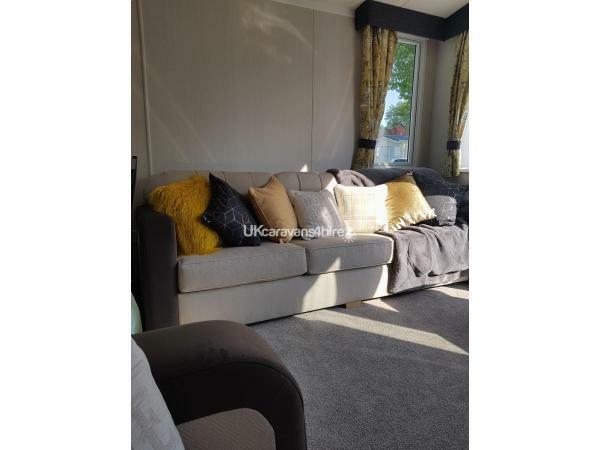 Would definitely go back here and would recommend this caravan for any family.In the long run it saved us money as the kids were happy to stay in and enjoy playing board games and eat in the caravan. Gillian the owner kept in touch before and on our arrival to see if everything was ok.Great service .Try it! Had a fantastic week, caravan is absolutely stunning and had everything we needed. Owners were fantastic from the start, full info at booking stage and kept in touch throughout we couldn't of asked for more. 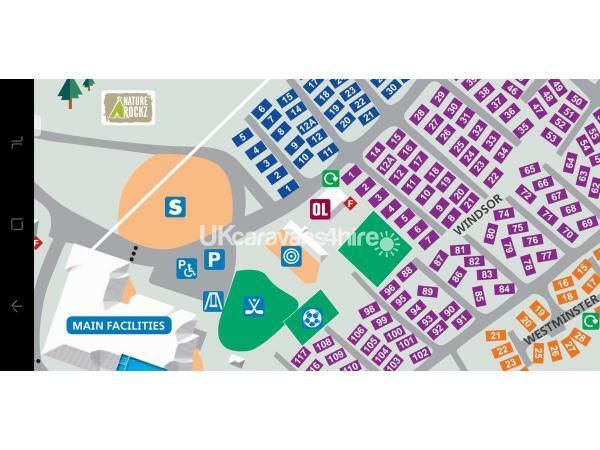 Caravan is ideally situated, a 2 min walk to facilities. Decking area lovely, and a plus was the dishwasher it came in very handy! A really nice touch was the tray of tea, coffee, hot chocolate and spreads! Whole family enjoyed and even kids said best caravan we've ever stayed in! Couldn't recommend enough and would definitely return. Accommodation excellent with everything you need, very comfortable and welcoming. Can not fault anything and in my opinion Gillian has a beautiful caravan and i would recommend it to anyone. Absolutely stunning caravan. Gillian and Wayne have really got a little gem there. The family all loved it. Spacious, clean and very comfortable. Not to mention a dish washer. Yes a dish washer. The location is perfect too very close to all amenities. It really was the perfect little break the family needed. I would recommend this caravan to anyone looking for that perfect break. Thank you Gillian your service was fantastic.???????????? Oh thank you very much indeed. You were so lovely and looked after our caravan it was a pleasure. Hope to see you again soon. Many thanks. 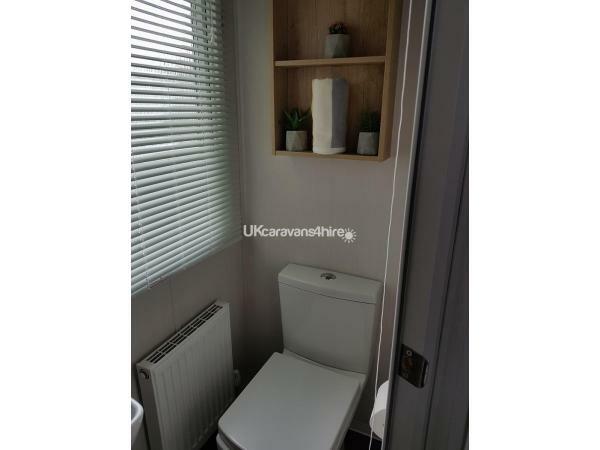 Everything about this caravan was great it was lovely and modern and very clean. It is on a great location on the park only a short walk to the main entertainment. Gillian the owner was really friendly and helpful. I would definitely book again. Thank you very much Stacey, hope to see you again soon. Such a lovely caravan. Home from home. Gillian very helpful. The little touches such as tea/coffee sachets etc and sauces. could not fault anything will definately hire again. Thank you very much Audrey and glad I could be of help. Hope to see you again soon. I am so glad you enjoyed your stay and can't thank you enough for the care you took of our caravan You left it immaculate. Thank you so much and hope to see you again soon ( but can't promise the weather next time!). We stayed here recently with our son and newborn & we couldn't of asked for a better caravan to stay in or better people to hire off. Everything was immaculate from the bed linen to the tea/coffee facilities.... Perfect getaway & will definitely be visiting again, would highly recommend to anyone looking for a little holiday break. Nicest caravan we have ever seen. When we walked in we all said wow and you could tell it was brand new. The oven and hob were great and made cooking for 6 really easy. The extra touches like the selection of teas and coffees and hot chocolates was a nice touch. Beds all made up on arrival with nice linen and even some towels left in the bathroom. Only 1 minute walk to the facilities was fabulous! Definitely worth a visit. This caravan was stunning. 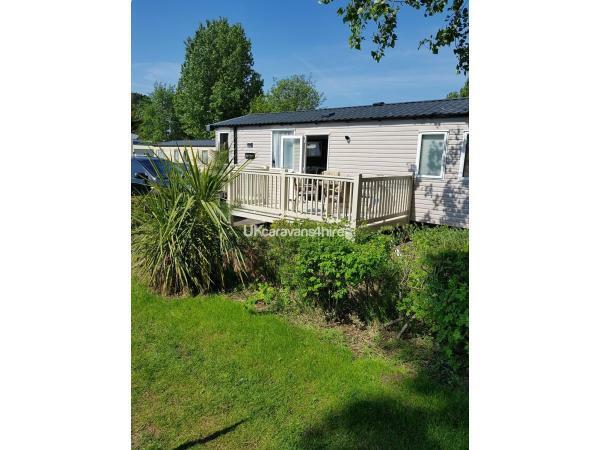 Brand new, lovely outside decking area and great location just a couple of minutes walk from the facilities (Park, pool, restaurant etc). Great friendly service from enquiry to booking and great value considering it was half term school holiday week! The owner met us at the caravan to hand over the keys, showed us around and how to operate various things in the caravan, inc the Dishwasher! (Yes a caravan with a dishwasher, awesome!) Everything was spotless and the caravan inc nice little touches like an assortment of tea, coffee, jams, nutella sachets etc which we have never had at any caravan we have stayed at. The deposit/bond paid on booking was also returned quickly after our stay. All in all a wonderful caravan and a wonderful owner to deal with. Would highly recommend. Thank you very much for your kind comments. Look forward to seeing you again soon!